Navpops users won't be able to enable Page Previews unless they disable Navigation Popups gadgets from gadgets tab. We cannot disable it for users, the user has to do it manually. we can link to the gadgets tab though. The blue link that says "disable navigation popups" will link to https://en.wikipedia.org/wiki/Special:Preferences#mw-prefsection-gadgets or just the hashtag "mw-prefsection-gadgets"
Display message: "For page previews to work, please disable navigational popups from [the gadgets tab]"
Display message: "Certain gadgets and other customization may affect the performance of this feature. If you notice issues with page previews, please go through your gadgets list and other customization"
Per T154573: [SPIKE] How do we efficiently detect when the NavPopups gadget is enabled?, we forward conflictsWithNavPopupsGadget to the client in the onMakeGlobalVariables script and include its value in Popups events. Resolved phuedx T154573 [SPIKE] How do we efficiently detect when the NavPopups gadget is enabled? T154573: [SPIKE] How do we efficiently detect when the NavPopups gadget is enabled? @ovasileva design done. can you add Acceptance criteria? Nirzar edited projects, added Readers-Web-Backlog; removed Readers-Web-Backlog (Design). ovasileva moved this task from Product Owner Backlog to Triaged but Future on the Readers-Web-Backlog board. ovasileva moved this task from Upcoming to Triaged but Future on the Readers-Web-Backlog board. phuedx added a subtask: T154573: [SPIKE] How do we efficiently detect when the NavPopups gadget is enabled?. ovasileva added a subscriber: phuedx. Am a little lost with what needs merging to call this complete but https://gerrit.wikimedia.org/r/#/c/328675/4 is holding up the merging of a few other patches. Am waiting for a reply from @phuedx. 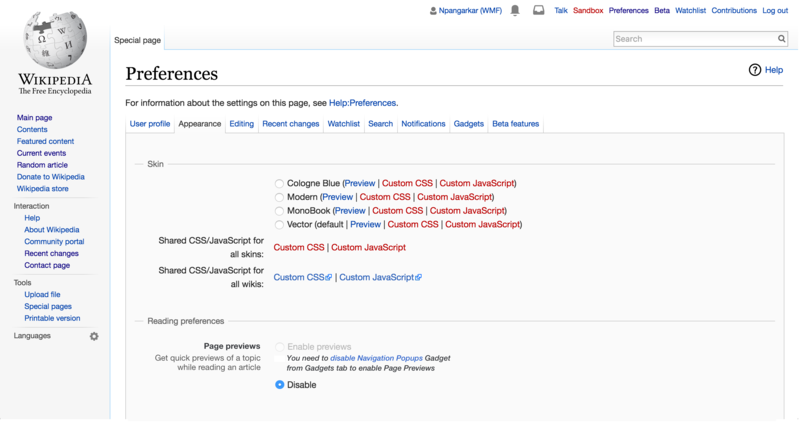 @Jdlrobson: rEPOP211f1d16589b: Disable Page Previews preferences when NavPopups are enabled needs testing and merging. I'll be doing the former in the next half hour. @pmiazga: IIRC we discussed making Popups\PopupsGadgetsIntegration::NAVIGATION_POPUPS_NAME configurable as the name of the NavPopups gadget varies by wiki. @phuedx I moved this task back to Needs More Work as it doesn't meet acceptance criteria yet. @ovasileva @phuedx - could you elaborate on If we DO NOT KNOW whether the user has navigational popups enabled? There are lots of different scenarios, instead of doing some overcomplicated checks [addinig necessary code complexity] I decided that we can show "Certain gadgets and other customization may affect the performance of this feature. If you notice issues with page previews, please go through your gadgets list and other customization" copy all the time. We will show "For page previews to work, please disable navigational popups from [the gadgets tab]" copy only if user has *Navigational Popups* gadget enabled. Navigational Popups gadget can be disabled but we are still not 100% sure that Navigational Popups is disabled as it might be enabled under a different name, or just can be added via global user scripts. For the record, this is available to test here: http://reading-web-staging.wmflabs.org. The tip text is appearing on left and a unreadable font size, can we match the alignment and fontsize with zeplin spec? Per T151058#2948518 (above) and the following observation: the PopupsContext#conflictsWithNavPopupsGadget variable isn't forwarded to the client so that it can be included in the instrumentation. I think that this is relevant to this task – the method was introduced while working on this task – but is also tracked in T152225: Finish rewriting instrumentation, which was actually blocked by this task. Therefore, I'll reopen this task, update the AC, and resolve T152225: Finish rewriting instrumentation. phuedx moved this task from Ready for Signoff to Needs More Work on the Reading-Web-Sprint-89-🎂 board. pmiazga moved this task from Needs Analysis to Needs More Work on the Reading-Web-Sprint-90-🍌 board. @pmiazga: I have a WIP for forwarding PopupsContext#conflictsWithNavPopupsGadget to the client. Do you want to take this? If so, then I'll discard my change. rEPOP6cc625270487: Add hovercardsSuppressedByGadget to logging (finally) gets rid of the "Missing property "hovercardsSuppressedByGadget"..." client-side exception. Thanks for merging that ^ @Jdlrobson! I've updated the staging server. @ovasileva: Did you take a look at this last week? phuedx added a subscriber: pmiazga. just re-tested - all done!